Le VPN Review will uncover the features, prices and other aspects of this reliable VPN provider which was founded in 2010. Le VPN is based in Hongkong providing VPN software that is developed in partnership with SparkLab’s Viscosity. Serving six years in the VPN industry, the world-class team of information security specialists have made it a cutting-edge introducing the HybridVPN service for their product. It was little pricey when we looked over the pricing plan of Le VPN, but the discounts offered are pretty and large enough to make the deal within your pocket range. There are 3 subscription packages that are offered by Le VPN. The best offer which is the most popular and recommended is the Yearly Plan which costs $4.95/month i.e. a total of $59.4/year saving 50% with the discount. Other than the yearly plan, there is Half-Yearly Plan which will charge you up with $7.95/month and a lump sum amount of $47.7 per 6 months. Last but not the least is the Monthly Plan which is available for $9.95/month. There is free SmartDNS and HybridVPN with 2 simultaneous connections over all the 3 packages. There are multiple options for payment when subscribing to Le VPN. They accepts most of the popular methods for paying such as Visa, MasterCard, American Express, JCB, Discover, CashU, Yandex Money, Qiwi, Necard, Boleto, PayPal and the most anonymous Bitcoin Payments. 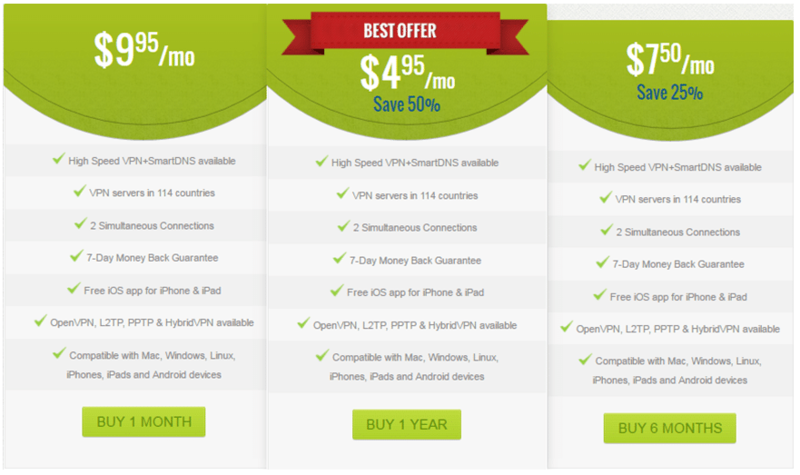 Le VPN offers 100% money back guarantee within 7 days after the purchase/subscription. That is to say if you feel yourself uncomfortable with their services for any reason, you can ask your money back without any questions asked. While writing this Le VPN Review, we were much impressed by the widespread server network of this VPN provider. They have a well-known server collection deployed in across 114 countries round the globe. This is surely a large amount covering 6 continents including South America, North America, Oceana, Africa, Asia and Europe with more servers in Europe, Asia and USA. With 700+ Le VPN servers scattered in almost every region of the world, you can upload/download torrents and enjoy P2P filesharing on some of those. Le VPN provides unlimited server switching with which you can switch one server to another regardless of the number of times you do so. Le VPN bestow their customers with an informative and helpful video review to guide them up with what Le VPN is capable to do and how it works. Most of the VPN providers offer almost the same features like unlimited bandwidth, no traffic logs etc. But Le VPN has come up with the features that are surely extraordinary and unique. Le VPN has bundled with all of their VPN subscription packages, a free SmartDNS service to get their customers the ease of access to the streaming channels anytime they want. This SmartDNS service is recently added with Le VPN so they only give you access to 48 channels belonging to the American, British and French media yet. However, these channels include all major channels which are on-demand… So, whether it is your favorite drama serial or a sport event or daily news, you don’t have to miss it in any case. The HybridVPN is a combination of VPN service with the SmartDNS. It works simply routing all your online traffic through the VPN tunnel plus unblocking the channels over American, French and British media. This HybridVPN combo provides you blazing fast connection speeds and the ultimate security which you desire. Le VPN builds a specialized VPN tunnel from which passes on the entire online traffic from your end to the VPN server. In addition to hide your IP address and change it with one of the Le VPN IP addresses, Le VPN uses shared IP addresses to provide true anonymity to the VPN users. This way you can save your neck from the snoopers, trackers and other surveillance agencies. Wide compatibility range for a VPN is essential for if you want to use your chosen VPN on any device you want. Le VPN is compatible with Mac OS, Windows (XP, Vista, 7, 8 and 10), iOS (iPhones, iPads and iPods), Windows phones, Android, Linux, Chromebook and DD-WRT Routers. Le VPN currently owns the Windows, Mac and iOS VPN clients only. However, they will soon be launching the connect app for other mainstream devices as well. Le VPN excels in providing an excellent security and privacy to its customers promising fast speed and unlimited data transfer on any of their pool of servers. The moment you connect to Le VPN, they ask you to choose any of the protocols. Le VPN offers the three major and popular protocols viz. OpenVPN, PPTP and L2TP/IPSec. The encryption level is standard i.e. AES 256-bits guarding your personal and credential information to the fullest of its extent. Le VPN providers only log the time stamps when the VPN users are connected and disconnected. They don’t log any of the information or online activity passing through their Le VPN tunnel or any of their VPN servers. The customer support of Le VPN consists of a Knowledgebase which provides most of the information about the installation procedures on different platforms. There is also a section for Frequently Asked Questions which also covers the basic issues about their product. Le VPN Live Chat is available 24/7, moreover, their agents assist their clients in 4 different languages via Support Tickets. The official website of LeVPN seems smooth and sleek providing each and every piece of information very neatly. You can find out the features, information about the server network, the pricing plans and whatever you want with the easy-to-navigate LeVPN website in different languages viz. Russian, Italian, French and Espanola. Le VPN provider is active over social media through a number of platforms. They have created a page on Facebook and a separate channel on YouTube named as ‘Le VPN’. Apart from these, Le VPN agents are also active over Twitter and Google+ and are ever-ready to help and assist their customers regarding any issue. No matter you own a Windows XP version or you have Windows Vista, 7, 8, or 10… LeVPN is usable on all said versions of Windows and just require the simple and easy setup steps within minutes. First, you have to download the Le VPN Windows software from their official website. Click the downloaded file and proceed with the step-by-step procedure to complete the installation. Once the installation is completed, you will need to insert your VPN username and password in order to connect to one of their servers. Finally, you are connected with the Le VPN and are free to use the internet in your own terms. For further assistance, you can watch the video review to get a clear insight of how to setup Le VPN on Windows. 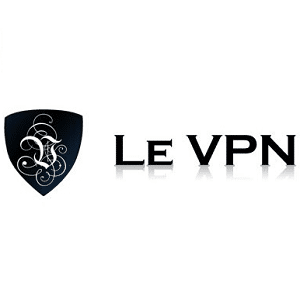 Le VPN is a new entrant in the VPN industry, yet it is a trustworthy and properly managed VPN service looking after its customer base very well. Although the features list is not competing with that of the other big boys which have been in the VPN town since many years but the SmartDNS and HybridVPN makes it worth your money. Overall, if one is to give it a try then it won’t provide a single reason to regret it.